Our sturdy tote is ready for a monogram. Contrast handles and trim internal accessory pockets and key fob exterior pocket. Stands upright with a flat bottom. 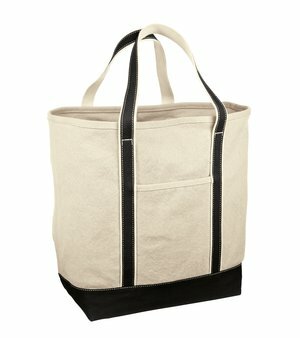 Made of 24-ounce 100% cotton canvas. Note: Bags not intended for use by children 12 and under. Prop 65 and social responsibility hangtag. Bulk orders of 20 or more of the same product may qualify for discounts. If you would like to personalize this product please contact us for services and pricing. Casual Clothing for Men, Women, Youth, and Children © 2019. All Rights Reserved.